Mitsubishi, a Japanese car manufacturing company, has rolled out its new version of Outlander SUV with a reduced price and increased seats. 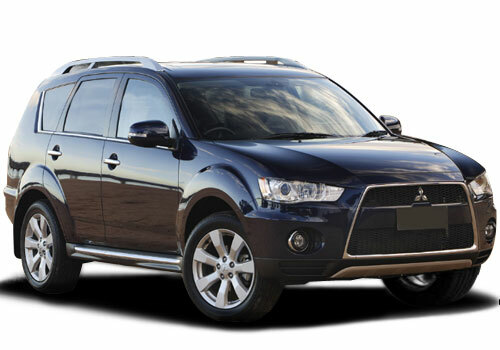 At present, Mitsubishi Outlander SUV is available in a 5 seater model with a denomination of Rs.20.25 lacs in India. Mitsubishi Outlander price is tagged at Rs 19.25 lakh which is one lakh cheaper. There is nor any removal of equipments in new Outlander SUV 7-seater neither the seating arrangement has changed only a thin jump seat has been added at the rear to accommodate a couple of extra passengers. The only advantage of the jump seat is that it can be completely removed by rolling out to provide extra space for luggage. All the variants spanned by Mitsubishi Outlander are driven by a 2.4 liter engine that runs on a petrol motor and produces a power of 167bhp and a peak torque of 23kgm. This all-alloy twin-cam 4 cylinder engine is coupled with a 6-speed CVT box. Mitsubishi Outlander pictures suggests that the SUV has a stunning look and style specially the front grill and the steering wheel. It provides a great comfort and a bit extra leg space as compared to the earlier version. The Outlander is equipped with steering wheel mounted audio and cruise control, keyless entry, HID headlamps with AFS function, adjustable headrests and front and seat belt anchor and leather seats with seat heater. The side mirrors are remote operated and there is an automatic hearlamp leveling device. Mitsubishi Outlander review reveals the safety features such as ABS with EBD, collapsible steering column, Reinforced Impact Safety Evolution body, child protection rear door locks, a theft protection device and front dual air bags have also been added. It is said to attain a maximum speed of 190km/h. The company is also launching its refreshed model of 7 seater Outlander in 2013 with a proper third row. But it will take a whole long year, before the company gets the 2013 Outlander in the Indian market.